The biannual Tokyo Motor Show that ended on 1 December proved to be yet another astounding showcase of Japan’s technological creative capacity. Motor shows are usually a chance for automakers to dazzle consumers with their latest high tech wizardry, but this year’s show had even more significance with the announcement of Tokyo as the host city for the 2020 Olympics still continuing to be very much a source of national pride here in Japan. Two of the factors that Tokyo used to convince the International Olympic Committee that it was the best city for the games was its capacity to be both an environmentally-friendly and a futuristic city, and the Motor Show was an opportunity to show the world what that meant. The rather confusing theme of this year’s show was “Compete! And shape a new future” and in their explanation, the organisers used sport as a metaphor for the way that car designers and engineers compete with each other to create vehicles that will astonish and inspire people. From a less philosophical, technological point of view, there seemed to be two main themes at this year’s show: eco-friendly engines and driverless cars. Nissan was showcasing its “BladeGlider” zero-emission electric concept car which has the driver’s seat positioned in the middle of the car, supposedly giving the person at the wheel the sensation that they are in a glider. Nissan also got some big publicity during the show when it tested a driverless prototype car equipped with its “Autonomous Drive” technology on a section of expressway in Kanagawa prefecture, just outside of Tokyo. Journalists were invited to watch a driver sit behind the wheel of a moving car without having to touch it. The car traversed a 2.3km stretch of the highway while changing lanes, overtaking other cars and merging into traffic while driving at speeds of up to 80kph. The self-driving car was created by modifying one of Nissan’s popular Leaf models and became the first ever autonomous drive vehicle to be given a license plate in Japan last September. In recent years, the battle between GM and Toyota to be the world’s number-one car maker has been fierce with Toyota maintaining its marginal edge in sales this year. Toyota did a fine job of showing that it has no intention of giving up the leadership position by presenting the FCV (it stands for fuel-cell vehicle) concept car, which Toyota says will be the blueprint for the type of cars that will be in use for the next 100 years. The car utilizes hydrogen power to give the car a driving range of 500km and, what is more, refueling the car will take only three minutes. The car is scheduled to go on sale in 2015. Without doubt though, the vehicle that most people felt was something straight out of a science fiction movie was Toyota’s FV2 (Fun Vehicle 2). 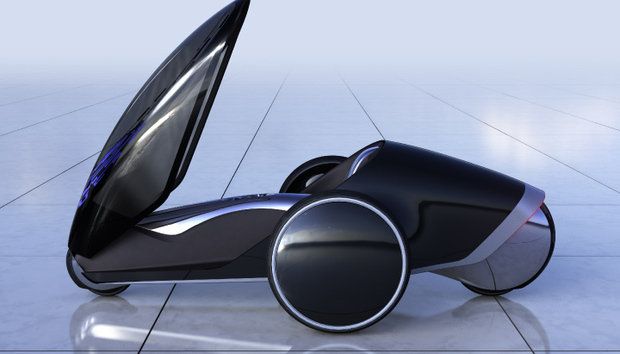 This rounded, pod-shaped transport machine has four wheels laid out in a diamond shape, no steering wheel, accelerator or brakes. It is controlled by the direction and intensity with which the person inside leans and it can be driven either standing up or seated. The windscreen acts as the door and stays in an upright position when the driver is standing and then automatically closes to enclose the driver when s/he is seated. What really makes the FV2 futuristic is the idea that it will be able to detect changes in voice and facial expressions to sense the emotional state of its occupant. Once it knows how the driver is feeling, not only can the exterior of its body change color in accordance with the driver’s emotional condition, but it can also suggest places to go, depending on the driver’s mood and where they have been in the car previously. When explaining the concept of the car, the developer of the FV2, Mr. Moriai, said that it will have the capacity for “direct intuitive communication between driver and vehicle” and become more intelligent and friendlier as it gets to know the person driving it. The company says that the relationship between a person and their FV2 is supposed to mimic the close bond between a horse and its rider as the vehicle’s artificial intelligence is able to invoke fondness and trust. It is quite obvious that some people will find the prospect of a car that tries to be your friend rather unsettling but this is one of the primary ideas behind Toyota’s so called “Heart Project” which aims to use artificial intelligence to make a world in which the relationship between man and machines is more enjoyable and fulfilling. Ben Olah is originally from Sydney but he has lived in Japan since he graduated from university. He says that, even after having lived there for many years, he never ceases to find Japan and its people to be a source of amazement. Ben Olah is originally from Sydney but he has lived in Japan since he graduated from university and, even after living there for many years, he says he never ceases to find Japan and its people to be a source of amazement. Ben is passionate about innovation and transfixed by the way that technology is changing our society in ways that nothing before has even done.